Krishnan Raju and several officers at the basement carpark of the condo, before he was brought to the unit where the crime took place. SINGAPORE - The 50-year-old man accused of murdering his wife was brought back to the crime scene on Wednesday (Nov 1), spending nearly two hours at a Loyang condominium where the alleged offence took place. 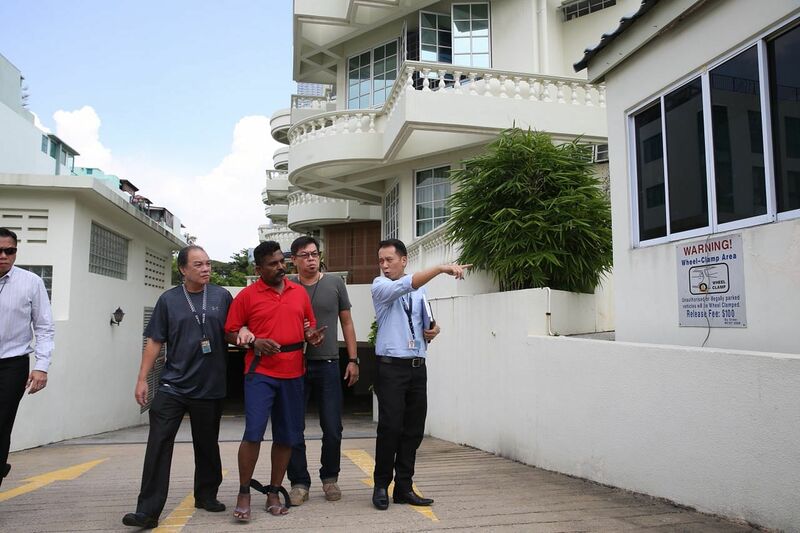 Outside the apartment, the media saw Krishnan Raju pointing out the direction in which he had fled from the Loyang Gardens condominium before entering Malaysia last Thursday (Oct26). Forensic experts were also at the scene to collect evidence. While inside the apartment, the accused also pointed out the spot where he had allegedly killed his wife. Krishnan, who was charged on Saturday morning with the murder of 44-year-old Raithena Vaithena Samy at Loyang Gardens, was driven into the estate in an unmarked van at about 11.59am. Wearing a red shirt and dark-coloured bermudas, he looked down and moved slowly as his legs were bound while being led out of the van by several officers into the apartment. The alleged murder took place between 9pm and 10.48pm last Thursday. The Straits Times understands the weapon used was a knife, and the victim suffered multiple stab wounds, including one to her chest. The police said they received a call for assistance at 12.12am last Friday from the couple’s daughter. They are understood to have a son as well. Krishnan was nabbed at Woodlands Checkpoint about 10 hours after the incident. He is understood to have entered Malaysia via the Causeway before returning to Singapore, where he surrendered himself. According to Accounting and Corporate Regulatory Authority records, Krishnan owned a transport company.